Hello ... Hello ... my old friends ... It's great to see you once again! 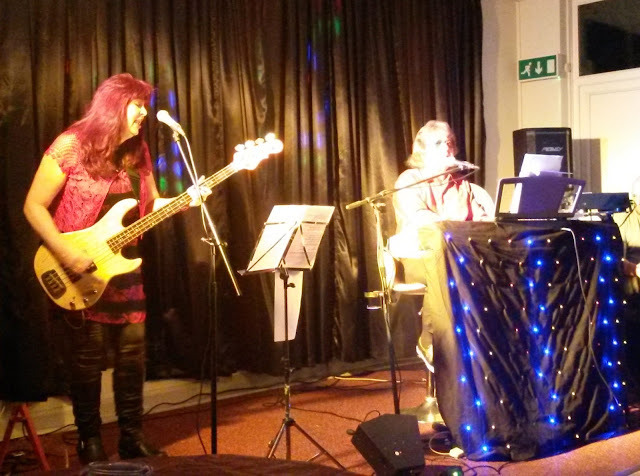 The return trip to the homely and friendly Wootton Wawen Social Club in somewhat foggy Warwickshire to see Mike Sheridan perform a festive tinged set of tunes alongside wife Suzi was well worth the repeat 45 mile drive for elobeatlesforever (elobf) and Yours Truly KJS on last night (Friday 16th December) as the 'Brum Beat' legend produced another entertaining evening of cracking music and comic banter. Mike & Suzi Sheridan proved again that they remain the most talented of double acts in the way that they combined a well chosen set of 25 songs, including not a few festive faves, with some truly funny moments of wedded wordplay including a clever new version of "Rockin' Around The Christmas Tree" with slightly different lyrics that many married folks might agree with, perhaps in silent approval! Suzi's renditions of "Since I Don't Have You" and "Wind Beneath My Wings" were classy whilst Mike rolled out a a nice version of Steve Gibbons' "Tulane", the Roy Wood penned Wizzard classic "I Wish It Could Be Christmas Everyday" and old pal Jeff Lynne's UK #3 hit single with ELO: "Don't Bring Me Down". 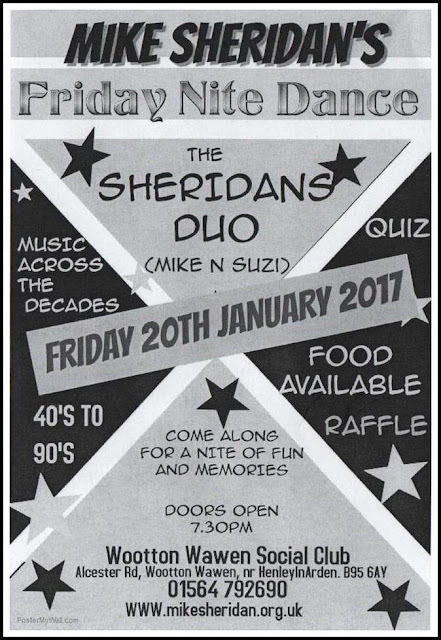 I've now missed The Sheridans take on "When I Was A Boy" on a couple of occasions and sincerely hope that I'm third "Time" lucky when Mike & Suzi Sheridan next return to Wootton Wawen Social Club on Friday 20th January 2017.
elobeatlesforever (elobf) recommends Mike 'n' Suzi Sheridan to those enlightened folks who enjoy the music of ELO, Jeff Lynne, Roy Wood, The Move, The Idle Race, 'Brum Beat', The Beatles and related artistes. Go see 'em!